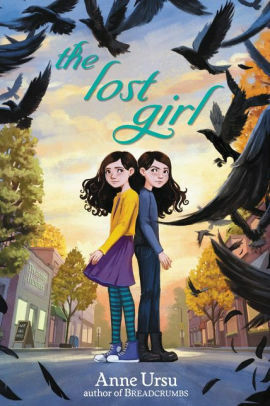 The Lost Girl by Anne Ursu. HarperCollins (Walden Pond), 2019, 355 pages. “The two sisters were alike in every way, except for all the ways they were different.” Iris was the factual, practical one; Lark the dreamer. Lark was also the precarious preemie who almost didn’t make it out of the hospital–twice. Iris has always felt a responsibility to take care of her more fragile twin, and that’s why the news that they won’t be in the same class for fifth grade is devastating to both. It was a deliberate decision—both parents and the school principal thought it best that they begin to develop their own talents, even their own after-school activities. Accordingly, Lark goes to an extra-curricular art class after school and Iris is enrolled (against her will) in a girls’ club called Camp Awesome. Camp Awesome is as hokey as it sounds, with a rah-rah counselor, Abigail, encouraging the girls to celebrate their super powers. Problems develop: Iris goes almost silent in class and club while Lark struggles to defend her weirdness on her own. Plus, items keep disappearing, like Lark’s moon bracelet. Iris’ friendship (if that’s what it is) with the enigmatic proprietor of Treasure Hunters Antique Store threatens to take a very sinister turn. And what about all those flocking crows—are they portents of help or of harm? Magic has a cost. Everyone has something to lose, and trading possessions for power usually has a downside. Over and above Abigail’s bland assurances about “girl power,” the twins confront a real power that may have traded its very soul. Iris, whose former confidence has been shattered, discovers new allies in unexpected places, while Lark discovers a core of strength in herself. The conclusion, with its feminist overtones, may put off some readers, but there’s enough personality and character development to make the story worthwhile.